It is because of a patchwork of ideas of governance that both of India’s main parties are resilient, because they appeal to large segments of India’s population, which is itself made up of innumerable interest groups, jatis (castes), and religions, which often have shifting agendas. In the first part of this series, I described the differences between the “Gupta” and “Mauryan” approaches to government, channeled today by the Bharatiya Janata Party (BJP) and Congress, respectively. Neither approach is better or worse in totality; for example, if one desires both social reform and economic growth, then they would have to learn toward the BJP on economics, and Congress on using state power to abolish social customs deemed archaic. But a libertarian would disagree with that approach altogether, as would a committed socialist. Moreover, it is important to note that both of India’s main parties actually combine both the statist and nonstatist approaches in different permutations, and neither is ideologically consistent. 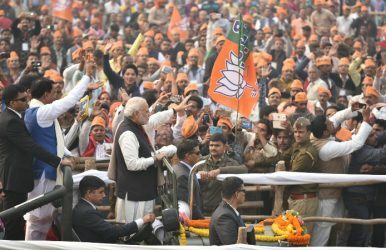 The BJP is not only the party of Hindu nationalists, but a coalition of anti-statist factions, ranging from Hindu conservatives, free-market businessmen, and members of the often socially liberal, urban middle-class and upper-castes who resent the state for holding their potential back with regulations and caste-based quotas. This coalition, envisioned by former Prime Minister Atal Bihari Vajpayee when he founded the party in 1980, is the reason for the BJP’s success and growth beyond being merely the political wing of Hindu nationalist groups. If the party fails deliver to these other factions, it will lose many voters, except for the Hindu conservatives, its core. And there are not enough of these to propel its momentum forever. Likewise, the Congress is a coalition of many groups: secular liberals, farmers, much of the old middle class, former aristocrats and elites — a very big tent so to say, one that lost its coherence under weak leadership and corruption scandals during the 1990s and 2000s, to the point where it appeared to be a coalition of landlords and political bosses for the extraction of revenue from the state and population. Nonetheless, it does have an ideology and purpose, which is the use of the state to reshape society and the economy. As a result of India’s political configuration, it is no surprise why an Indian Lee Kuan Yew never has and never will emerge. There are too many factions and groups with vested interests at stake for that sort of technocratic vision. Nonetheless, long-term planning is vital for India to prosper. Neither the short-term platforms of the BJP or Congress, which often involve subsidies and giveaways of things such as gas canisters or televisions, will engender large improvements in people’s lives. Until systematic solutions are pursued, the basic problems of unemployment, development, farmer’s issues, education, health, and pollution will not be rectified. Tackling corruption, and appointing competent ministers, while important, isn’t enough alone to change India’s trajectory. The state often inhibits private economic growth and the development of successful businesses while failing, sometimes grievously, at providing basic services, such as the electricity and education necessary for individuals to move out of the agricultural sector into the manufacturing sector. This vision of the state, which I had termed the Gupta model, has a long history in India, and is different from the East Asian Confucian approach to government, which partially explains India’s societal developmental outcomes versus China’s. While heterogenous and religiously plural India has avoided a governmental approach that could lead to the gulag and re-education camp (instead achieving a “tyranny of cousins,” to use Francis Fukuyama’s term), it is also a poor provider of primary government services. This can be expected of both BJP and Congress governments, despite the latter being more statist, because statism in the Indian context means free goodies and more subsidies, and not more efficiency and public services. India is a very top-heavy society: it pours money into programs to reward those who get to the ends of its various value-chains, such as the prestigious Indian Institutes of Technology (IITs) as well as subsidizing the poor who need to use hospitals, but does little to provide primary or preventative medical care. As Amartya Sen points out, India has to make serious improvements in its primary education outcomes, a task that only an institution with the resources of the state can do in entirety: “The whole idea that you could somehow separate out the process of economic growth from the quality of the labor force is a mistake… India is the only country in the world which is trying to become a global economic power with an uneducated and unhealthy labor force.” The people, especially those without means, cannot reasonably be expected to somehow fend for themselves. Despite the failure of both parties to improve the lot of the middle class and provide them jobs, as well as addressing the conditions of the poor, many portions of these groups continue to vote for the major parties in hope that one of them will finally make the requisite improvements. How the BJP and Congress fare at winning over many of these voters, the middle class and rural poor, will often determine the outcome of an election, as these parties’ respective bases aren’t large enough to win on their own. This explains why there will be a continuous seesawing between the BIP and Congress in India.